CHECK OUR HOT LINE FOR CURRENT INFO!! WE ARE OPEN FROM 5 AM TO 5 PM DAILY! The Salmon fishing was wide open again today. There were limits reported from the 6 Pack Charter boats in a few hours of fishing. There have been limits reported by the party boats who are mooching closer to Moss Landing. The majority of the boats from Santa Cruz had limits in a hour. The fish were on the bite from 36'50/122'03 to 36'47/122'00. There were some other good scores on the east edge of the Soquel Hole at 36'49/121'54. The Moss Landing area is still producing limits in the middle of the canyon in 300-800 feet of water. The anglers are doing good trolling Purple Haze Hoochies, Blue kajikis, Glow Krippled Anchovies, and Glow F.B.R.'s. The deep water fishing for Rock fish was hot. The Mega Bite had limits of big Vermilions in the deep water. The wind was down in the morning but it got a little bumpy in the afternoon. The Salmon fishing was great today before the wind blew. There were anglers catching limits from 36'50/122'03 to 36'49/122'00. The east edge of the Soquel Hole was good at 36'50/121'54. The area below was hot as well at 36'47/121'53 and 36'46/121'54. The majority of the fish were eating Anchovies and Krill near the surface so anglers did best fishing from 30-80 feet down. The best lures were the Chrome Krippled Anchovies, Dill Pickle Spoons, Purple Haze Hoochies, Blue Kajikis, and Green Hoochies. The wind was up in the morning but the anglers who went out were rewarded. There were a bunch of limits reported by 8:00. as you can tell by the G.P.S. number on my site the fish are all over which is a good thing! The Salmon fishing was good at the Soquel Hole today. The anglers are finding bird piles along the edge of the Soquel Hole with Salmon feeding below. There were some limits reported at 36'51/121'57 and 36'51/121'54. 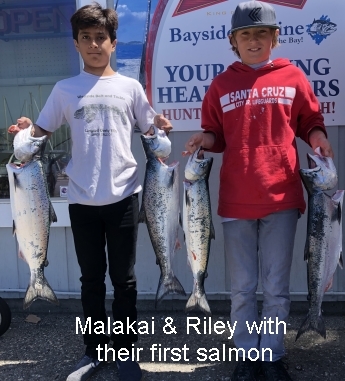 The anglers near the canyon in the deep water at Moss Landing did good as well. The weather was nice in the morning but it did blow in the afternoon. The Rock fishing has been good in the deep water. 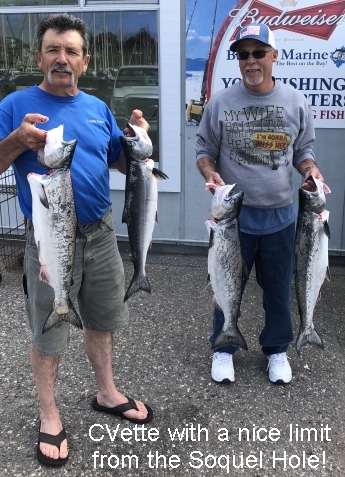 The Salmon bite continues to be good for the anglers trolling and mooching. There were some good scores of Salmon caught on the east side of the Soquel Hole near 36'51/121'53 and 36'51/121'55. There was a good bit near Moss Landing in the middle of the canyon. There were good scores for most of the boats out there. I fished near Moss Landing and caught 4 nice Salmon in the 10-12 pound range. We caught the Salmon on Chrome Krippled Anchovies and Glow Krippled Anchovies. The majority of the anglers were catching fish from 40-90 feet down. The wind stayed down all morning but it did blow around 1:00. The Rock fishing was decent at Natural Bridges. The water has moved around due to the winds so there are little pockets of fish all around the Soquel Hole. There was a boat who was Rock fishing and saw Whales and bait jumping up near 4 Mile Beach in 170- 200 feet of water. The Moss Landing area to Monterey has a bunch of clear blue and green water which is usually not good for Salmon. The area at the tip of the Soquel Hole was good for some of the anglers who fished early. There were some limits caught from 36'51/121'57 to 36'51/121'55. The majority of the fish were caught trolling Anchovies 80-180 feet down. The wind stayed down until noon and things look good for Thursday. The Rock fish was a little better due to calmer winds. The Salmon fishing was decent for the few boats who went out in the wind. There were some decent scores at the tip of the Soquel Hole (36'51/121'57). The Rock fishing was slower due to wind and swell. There were only a few boats fishing and the majority of them caught 1-4 Salmon on the troll. The wind has moved the water around and the Soquel Hole has the most feed and life. There were some limits reported from the party boats in front of Moss Landing. There have been some fish caught near Davenport. The wind is expected to be less tomorrow. The fishing for Salmon was good for some of the anglers near the tip of the Soquel Hole. There were some limits caught at 36'51/121'57 to 36'50/121'55. There were a few Salmon caught in 130 feet of water near Capitola. The anglers near Mulligan's and Soldiers did decent in 180-220 feet of water. The majority of the Salmon were caught 60-120 feet down. The Krippled Anchovies and Blue Kajikis were working well. The wind was down until noon but it did get bad until 2:00. The Salmon fishing was pretty good for most anglers who fished on both sides of the Soquel Hole. There were some limits caught near the bottom at 36'51/121'59. The area from 36'49/121'57 down to 36'50/121'55 was good for the anglers who worked hard. The bite was good around 7:00 and 11:00. The Salmon are being caught near the bottom but there were some fish caught 80-150 feet down. The best bet has been trolling Chrome Krippled Anchovies, Glow Krippled Anchovies, and Pearl Krocodiles. The area near Moss Landing was slower today near the Sand Plant. The fishing near the Soquel Hole was pretty good for most anglers. There were some limits reported at 35'50/121'55 and 36'51/121'56. The majority of the Salmon were caught in 180-280 feet of water and 100-180 down. There were some limits caught on the west side of the Soquel Hole in 250 feet of water on the bottom. The area from Mulligan's to Soldiers Club is still producing some nice Salmon. 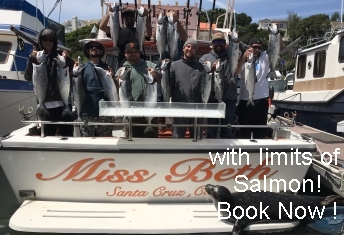 The area at 36'47/121'50 was good for Salmon the majority of the fish down near Moss Landing and Monterey were caught in 170-220 feet of water. The majority of the Salmon down there were caught 40-110 feet down. The Glow Krippled Anchovies, U.V. F.B.R. 's, Chrome Krippled Anchovies, Green Hoochies, and Watermelon Apexes were working good today. The Rock fishing was decent near Natural Bridges. The wind stayed down until 1:00. The Salmon fishing was good today. There were some limits reported on the east edge of the Soquel Hole at 36'51/121'57. The majority of the fish at the Soquel Hole were caught 110-200 feet down. There were some solid scores for the moochers and trollers near Soldiers Club. The anglers are fishing from the Sand Plant to Soldiers Club in 180-220 feet of water. The majority of the Salmon were caught on Anchovies 80-110 feet down. The wind was not as bad as expected and the swell dropped. The weekend should be a good time to catch Salmon so we will see you soon! The Salmon waters have been windy for the last few days. There has been a few fish caught at the east end of the Soquel Hole. The Soldiers Club was good this morning for the anglers who braved the wind. The weekend is looking good so we will see you soon! The weather was not bad today and the few boats who fished the east side of the Soquel Hole caught fish. The Salmon were caught in the same area on Blue Kajikis, Chrome Krippled Anchovies, and Watermelon Apexes. The Salmon were caught 180-220 feet down near 36'50/121'57. The weather was decent until 11:00 am. The Rock fishing was good near Natural Bridges. The fishing for Salmon was decent for the few people who went out in the wind. There were a few fish caught at 36'50/121'55. The wind blew hard at 9:00. There were only a few fish caught due to very few people fishing. The Salmon fishing was slower in the morning but it turned on in the afternoon. The area near Moss Landing was slow but there were a few fish caught near the yellow can. I fished near 36'51/121'57 and 36'50/121'54 in 170-250 feet of water. We caught a few fish in the morning 140 feet down. In the afternoon the bite turned on and we ended up with limits. We caught the majority of our fish on Chrome Krippled Anchovies and Glow with red nose Krippled Anchovies. The Salmon we caught were down 150-200 feet down. The wind was not bad until one. The deep water Rock fishing has been good but the swell has slowed down the inshore bite. The Salmon fishing was great on the east end of the Soquel Hole to the Pajaro flats. There were limits reported around 36'50/121'56 down to 36'50/121'52. The majority of the limits were caught trolling 110-190 feet down. The Salmon were biting near Mulligan Hill in the same depth of water early this morning. 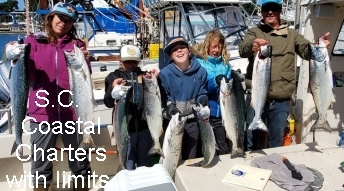 There were some early limits reported from Moss Landing as well. There were some boats who went out in the afternoon on the east side of the Soquel Hole and caught limits in a hour. The wind was down all day but there was some swell. The swell slowed the Rock fishing so go for the Salmon! The Salmon fishing was good for some and slow for others. There were a few good scores on the east edge of the Soquel Hole to Pajaro. The majority of the Salmon were being caught in 200-250. The Salmon were biting Glow Krippled Anchovies, Green F.B.R. 's, and Blue Kajikis. The majority of the Salmon were caught 110-220 feet down. The Mulligan's area did produce some nice Salmon in 190-240 feet of water. The Soquel Hole was decent with some scores of 1-3 fish a boat. I did not get any reports of anglers looking up near Davenport despite the incidental Salmon being caught there all last week. The best bite was around 7:00 to 10:00 during the tide change. The Rock fishing remains good. There have been some Halibut caught near Natural Bridges and the Cement Ship. The wind was blowing for the south in the morning but then it laid down. There were only a few anglers fishing for Rock fish today. The weather was not bad with a small swell and a little south wind. We will see what happens for the Salmon opener tomorrow. The Rock fish and Lingcod continue to be caught near Natural Bridges and Davenport. The weather has been odd with south winds and swell and flat calm days. A few Halibut have been caught on the beaches near Rio del Mar. The Striped Bass continue to bite Swim Baits and Lucky Crafts near Marina. The Rock fishing continues to be good for the anglers fishing. The wind was down in the morning and the swell was small. There were only a few boats out on the water today for Rock fish. 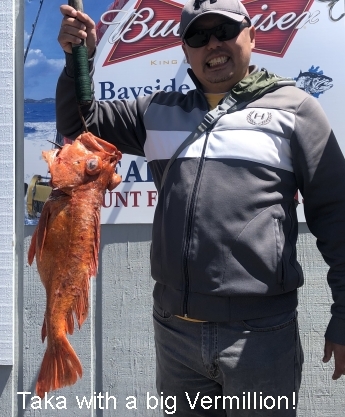 There were some nice Lingcod and Rock fish caught on the west side of Santa Cruz. The weather was not to bad but it was raining. The Rock fishing was good today. There were limits caught by 10:00 am near Natural Bridges. The wind stayed down all morning. There have been a few Halibut caught near Capitola. The Salmon opens Saturday so get ready! The Rock fishing is going to open on April 1 and the Salmon season opens April 6. It is time to get ready! There have been some nice Halibut caught trolling near the Cement Ship. The big Sand Dabs and Sole are being caught in 300 feet of water. 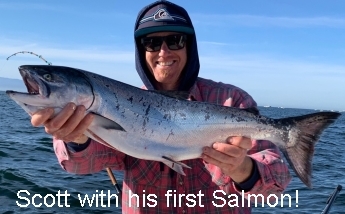 There have been a few incidental Salmon caught while fishing for Sand Dabs on the east side of the Soquel Hole. The Surf Perch have been on the bite near Rio del Mar. There have been a few Striped Bass caught on Lucky Kraft Minnows. The weather has been nice and the Santa Cruz Harbor is open with no problems. We have live Ghost Shrimp, Blood Worms, and Pile Worms for your surf fishing! Get some and win the Sand Crab Classic! The Salmon and Rock fishing is about to start in April. Stop by and get ready now. If you need reels or rods serviced this is the time to do it. We will have some Pile Worms for the Perch tournament this weekend coming up! The weather is great and the harbor mouth is fine due to small swells. There were some reports of a Halibut being caught trolling near the Cement Ship. The Sand Dabs are biting in 150-220 feet of water near Pajaro. There have been some incidental Salmon caught and released while fishing for Sand Dabs. The Soquel and San Lorenzo rivers have been producing some quality Steelhead. The Steelhead are biting Roe, Night crawlers, Pink Worms, and Little Cleos. The Surf Perch fishing has been great with reports of 10-15 inch fish being reported from the beaches south of Rio del Mar. Copyright © 1999-2018 Bayside Marine. All Rights Reserved.